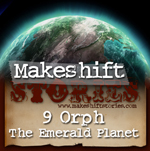 Orph The Emerald Planet is the second installment in a series of bedtime classics adapted to the Makeshift Stories universe. Based on the 1907 story by Laura E Richards The House with the golden Windows from a book of short stories with the same name, it presents the archetypal irony that grass always looks greener on the other side of the fence. Sareen tells her apprentice Fox a legend about the origins of the Sodality that she heard from Effie while Marooned on Ceres.